Marbeth Schon discusses American modernist studio jewelry, noting its most popular designers, the materials used, and the movement’s rise in popularity. She talks about influential museum exhibits, as well the ways in which designers took inspiration from each other. Marbeth can be contacted via her website, MSchon.com. My background is in fine art. My B.A. was in Art Education, so I started out as an art teacher. Later, I began working on a master’s degree in art valuation and started working for galleries. I enjoyed that side of it, the collecting and the sales, the gallery experience. I wasn’t really into jewelry, but we moved to Alexandria, Virginia and I worked for a gallery there called Silverman Galleries on North Saint Asaph Street. I was their art historian, and they had lots of jewelry, mostly estate jewelry, so I learned a bit about the history of jewelry, which I thought was fascinating. Rare Ed Wiener sterling cuff, c. 1947When I started collecting Mexican jewelry from the ’50s and discovered American studio jewelry from the same era, I was hooked. It reminded me of sculpture. I started researching the makers and writing about them, and I started collecting it. Now I also have an online gallery, mschon.com, where I buy and sell. Since I started doing this, I’ve never wanted to do anything else. I love writing about the people who are involved in the history and creation of modernist jewelry. I have an online magazine called Modern Silver Magazine, which is basically about jewelry, silver, and metal arts. I also wrote two books on jewelry. 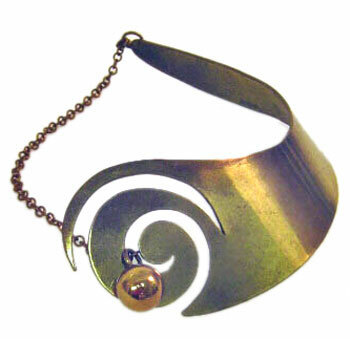 One is called Modernist Jewelry 1930-1960: The Wearable Art Movement, and that came out in 2004. My last book came out in May, 2009, and it’s called Form and Function: American Modernist Jewelry 1940-1970. I do collect jewelry. I love that period more than anything, but the great pieces are very expensive and hard to come by. I would love to still have a lot of the pieces that have passed through my hands. I’m more of a historian than a collector, I think, but I would love to collect it all. Collectors Weekly: So is 1930 to 1970 the era of modernist jewelry or does it go beyond that? Schon: It depends. My first book was 1930 to 1960, and my second book ended in 1970. In the ’60s, university programs started to develop much more serious metalsmithing programs, so jewelry-making got really big. I prefer to collect jewelry from 1930 to the 1960s, although I also collect contemporary handmade pieces by artists that I feel are working within the tenets of modernism. To me, that’s important. Somebody who’s actually working in a studio and creating one-of-a-kind pieces appeals to me, so it doesn’t necessarily matter when it was made. For the most part, all of the pieces were handmade and one of a kind. Artists would repeat their designs, and they did use casting early on, but it was usually to create a part or parts of a piece. In her later years, Margaret De Patta did some mass-production, but for the most part, jewelers were against that sort of thing. I’m talking about jewelry that was one-of-a-kind, handmade, hand-hammered, and produced in the studio. Hammer marks were evident on the pieces and the hand of the artist could be seen in the work. That’s an old Arts and Crafts idea. Collectors Weekly: Can you give us some background on the American studio jewelry movement? Schon: You could go back to the Arts and Crafts movement, but modernist studio jewelry really began in the 1930s. Modern art was popular in Europe in the late 1920s, early ’30s, but not so much in the United States. Then, with Fascism and Nazism happening in Europe, a lot of modern art innovators came to the U.S.
Laszlo Moholy-Nagy, who was involved in the Bauhaus, came over here and started teaching. He set up the New Bauhaus school in Chicago, which later became the School of Design and then the Institute of Design. People like Margaret De Patta started with him. De Patta was one of the earliest modernist jewelers and is still considered one of the best. She started thinking about the different concepts of non-objective jewelry design and things like the transmission of light and using different types of stones. Then there were people like Sam Kramer, who was both an artist and writer. He was influenced by surrealism, and his jewelry was just very different. Alexander Calder was also one of the first. There’s no founding father of American modernist jewelry, but Calder was one of the earliest and most influential sculptor-jewelers. He started doing wire sculpture in the 1920s. His jewelry was very simple and very direct. He worked in a primitive mode, inspiring a lot of the early American modernist jewelers to bring primitivism into their work. Then there’s Peter Macchiarini, who also started in the 1930s. He was another touchstone. 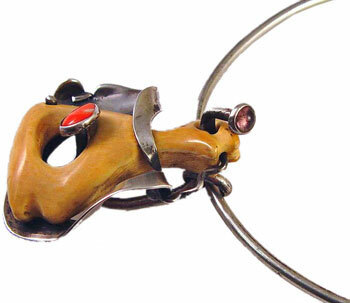 He did jewelry based on African masks and cubist art. Constructivism was another force. I have a picture in my first book of a piece by Art Smith, a very influential black jeweler in New York, that is reminiscent of a piece by Kandinsky, who was a major constructivist painter. You can see the intersecting lines with the circles and the balls. Sculptor Ibram Lassaw was involved in abstract expressionist art. 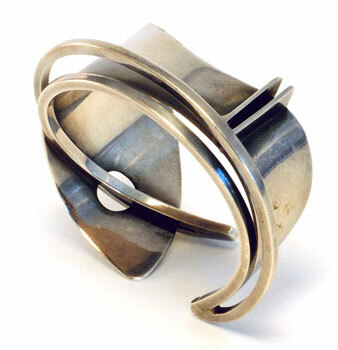 In his jewelry, he explored spatial relationships. So, basically, I think what defined these people was the influence on their work by surrealism, cubism, constructivism, abstract expressionism, etc. Many of these artists were immigrants, and they knew each other. Many lived and worked in Greenwich Village. They would go to the Art Students League in New York, which was a free program during the war. They were inspired by each other to push the limits of jewelry as an art form and to change the way materials were used. It didn’t matter whether the materials were intrinsically valuable. That’s what appeals to me about this jewelry—not the value, not whether it’s gold or silver or if the stones are diamonds, but the design and the uniqueness. The people who collected studio jewelry were mainly middle-class, intellectual, liberal Americans. There were certainly wealthy people who collected it—Nelson Rockefeller had many Lassaw pieces—but it mostly appealed to people who might live in places like Greenwich Village. Collectors Weekly: You mentioned some of the pioneers. Who were some of the other major designers throughout the decades? Schon: The major jewelers that people collect now are probably Sam Kramer, Ed Wiener [see his circa 1947 cuff at top], and Art Smith. The Brooklyn Museum just had a retrospective of Art Smith’s work. 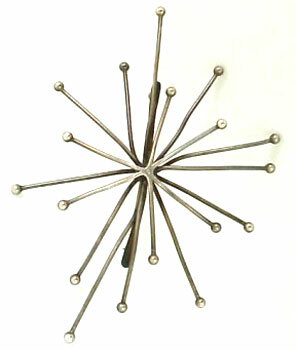 Betty Cooke was more of a Bauhaus-trained jeweler, and she worked in Baltimore. There’s Peter Macchiarini, Margaret De Patta, and Frank Rebajes. These are really the most famous people. There’s also Ed Levin, although he went into production later on, and then there’s Paul Lobel, too. The designers were certainly influenced by each other. Sam Kramer was one of the designers that people really looked to. His jewelry was partly surrealist. He used non-precious stones, and that was one practice other designers followed. You can see some of Sam Kramer’s ideas in Ed Wiener’s jewelry. Ed Wiener was another designer that people probably looked to for inspiration. He went through a lot of different phases, though. People also took inspiration from Art Smith. His jewelry is biomorphic, and he was a fan of African motifs. His jewelry was large and designed to wrap the body. Smith said that jewelry wasn’t anything until it was on the body. But despite all the influences, each designer was also quite individual, so that if you see the jewelry, you pretty much know whose work it is. Paul Lobel started earlier. His pieces leaned toward Art Deco when he started, and then he got more into a modernist sensibility. He also did musical instruments and animals, so he was more naturalistic and object oriented than some of the other jewelers. Collectors Weekly: Were there popular shapes that all artists used, or did each experiment with their own? Schon: In the 1950s, when biomorphism was popular, you had lots of kidney shapes. Those were definitely reused by many jewelers. You also see spirals, wire wrapping, and curves in the ’50s. Collectors Weekly: What materials did they use? Schon: De Patta started out with gold, but you had to have money to work with that. In Art Smith’s jewelry, you see some silver and a lot of brass and copper, while Macchiarini is almost all silver with different materials. They also started combining materials, and semi-precious stones were used more than ever before. Semi-precious stones, wood, ivory, ebony, enamel—those were the materials that they used most often. They started using materials like rutilated quartz because it was so interesting, and transparent stones because they could design things on the back that you could see. De Patta called them windows that the light can pass through. Collectors Weekly: Are pieces judged by value of their materials today, even though the designers weren’t thinking of it that way when they created them? Schon: Not necessarily. If I had an early silver piece by somebody like Bob Winston, it could be more valuable than a gold piece, even if it was 18 karat gold, because people are buying the early pieces. It’s the simple, honest pieces that people like. Peter Macchiarini was a sculptor before he was a jeweler, so a wooden mask by him with a little bit of silver may bring more money than something made out of gold. Today [summer 2009], gold is very valuable, so if somebody wanted to buy a piece just for its gold value, that’s different. In fact, I’ve had much more success selling early Ed Wiener pieces in silver than I have selling his later pieces in gold. Some people only want gold, but gold doesn’t make a Wiener more valuable to me. Some might disagree, but in my selling experience, it’s those early, honest, one-of-a-kind, signed pieces that people really want. Collectors Weekly: What are the current trends in collecting American studio jewelry? Schon: As the museums buy work by different artists and show them, that piques people’s interest—they want the pieces that are in museum collections. Margaret De Patta’s work is probably still some of the most valuable out there because she is considered one of the very best. She didn’t create for many years, so anything by her that’s early and signed is very valuable. You can still buy some little Art Smith pieces, but his big, iconic pieces, like his big lava cuff, command a fortune. Some Macchiarini pieces do as well, like his mask pieces and his little cubist things. A big surrealist piece by Sam Kramer with stones will sell for a lot of money. Ed Wiener also brings good prices. And then you have Calder. Calder’s jewelry is just out of reach. His exhibition started at the Norton Museum of Art in West Palm Beach, and then traveled to the Metropolitan Museum of Art in New York. A piece of Calder jewelry is worth thousands of dollars. I would say he’s at the top. Claire Falkenstein from California came a little bit later. Her jewelry also sells well. She did some wonderful, primitive things. Collectors Weekly: Are any of the studio jewelers still working? Schon: Merry Renk is still living and creating art, but not jewelry right now. Betty Cooke is still making jewelry in Baltimore. Peter Macchiarini died in 2000, I believe. Sam Kramer, Margaret De Patta, Ed Wiener, and Art Smith have all been gone for quite a while. Collectors Weekly: Did the jewelers and artists tend to sign their jewelry? Schon: Yes, for the most part, although you always find some that aren’t signed. There are so many jewelers I didn’t mention, but yes, most of it was signed. If it’s not signed, you can figure out who made it by the style and the materials. Sometimes you have to look at them and handle them before you know. You just can’t tell unless you get them in your hands. Collectors Weekly: Was this jewelry collected from the beginning? Schon: I think so. Maybe it wasn’t collected internationally right away, but people in New York would go down to the Village and stop in at Sam Kramer’s shop or Ed Wiener’s shop or Art Smith’s shop and buy jewelry. But these people wouldn’t sell their jewelry for much money when they were living. Peter Macchiarini’s shop was in North Beach in San Francisco. He had to make money, so he had to do some things that were a little more mundane than his big sculptural pieces—he did wedding rings and things like that. Museums helped a lot. In 1946, the Museum of Modern Art had a modern handmade jewelry exhibit. They got artists to make jewelry that wasn’t necessarily the type of jewelry people wore, and it was really interesting. The exhibit was called “Modern Handmade Jewelry,” and the idea was to bring together the artist as a jeweler and the jeweler as an artist. So that was the beginning. Then, in 1948, the Walker in Minneapolis had an exhibit of 32 jewelers called “Modern Jewelry Under Fifty Dollars.” Ten of the artists were from New York, which was the stronghold, but seven were from California. There were some from Minnesota and one from Washington, D.C. The exhibit traveled, but I’m not sure exactly where. After that, other museums started buying pieces and hosting more and more exhibits. Of course, after the war, there were programs for GIs, and universities and institutes started teaching jewelry making, so it just got bigger and bigger. In 1996, Toni Greenbaum, with with the Montreal Museum of Decorative Arts, put out the book Messengers of Modernism, and that got a lot of attention. Before that, there was the 50/50 Gallery in New York, and they were doing exhibits and things, but the jewelry was still pretty inexpensive at that time. After Messengers of Modernism came out, people became more interested. Then, of course, with the birth of the Internet, more articles, more books, and more information was available. In the last 20 years, the interest has really grown and the prices have gone up. Before that, people didn’t know as much, and you could find things for a lot less money. Right now the market’s slightly depressed, but that’s true in almost in every area. For the most part, I would say the prices are still rising. Collectors Weekly: So you see it growing as a collectible? Schon: I think so, yes, definitely. It’s still not universally collected. There’s still a certain type of person who likes it, but it’s definitely much more popular. My books have sold quite well, and I think it just piques people’s imagination, especially when they read the biographies. They say, “Oh, my gosh, this piece was handmade in 1945 by Ed Wiener who was a studio jeweler. There’s his mark,” and they’re proud to wear it. So I see more of that happening. Collectors Weekly: How do you decide what you want to keep in your own collection? Schon: It’s just so hard to come by that when I’m offered something, I’ll pick out the best that I can get. I really like Macchiarini, and I just got an amazing Bob Winston piece. I like enamels, pieces by Doris Hall and Virgil Cantini. I really like the early enamels of Robert Engstrom. I haven’t had a piece of Calder, unfortunately, and I haven’t had a De Patta. I’m poor in that respect. I have quite a bit of Armand Winfield jewelry, though. He was the first to encapsulate objects into acrylics. Right now everybody does that, but back then, nobody knew how to do it. He got students from the Cooper Union to make miniature works of art—watercolors, little constructions, beaded work—and he encased them in plastic. They’re so cool. I have quite a few of them. He’s a friend of mine, and he’s just great because he’s a true historian. He wrote the introduction to my book. He’s lived through all that. He knew those people in Greenwich Village. I love that. Winfield only made pieces from 1946 until the middle of 1948, but there are a lot of them. The prices are high, but it hasn’t caught on like some of the other pieces have. It’s a totally different type of jewelry. It’s more like art. It’s more like buying a painting or a sculpture than a piece of jewelry. Collectors Weekly: If somebody is fairly new to collecting studio jewelry, what advice would you give them? Schon: I would say to buy books and learn. Study. When I started, I got every book and every article I could find on the subject, and I studied. And definitely study the hallmarks. Get a book on marks and study them, as well as how the things were designed and the jewelers. It makes it more interesting because you know what you have. I have a group called SilverForum online, and there are almost 1,500 people who are members. And then there’s my online magazine, ModernSilver.com. There aren’t really any clubs that I know of. Of course, there’s American Craft Council, but that’s all craft. There’s SNAG, Society of North American Goldsmiths, which is probably the most important organization devoted to handmade jewelry. Collectors Weekly: Do you have anything else you want to add about studio jewelry? Schon: I just think it’s a really good thing to collect because it’s small and fits in a box or you can display it. It’s art and it’s still relatively inexpensive. I think it’s still undervalued and underappreciated, because you cannot replace it. It’s one of a kind. Studio jewelry comes from the hand of the artist. That’s why I like to write about it and talk about it. It’s a good investment, too, and you don’t have to hang it on the wall to enjoy it. You can wear it and appreciate it as a work of art. That’s what’s wonderful about jewelry as opposed to maybe a painting—it touches you. That’s what’s unique about it. You can actually wear something that’s unique, beautiful, sculptural, and is a piece of fine art with an interesting history. All of that is in one piece. It’s a wonderful thing to get into. I have a Art Smith copper and bras pin. It is 2 1/2 by 3 in. 2 flat arms(?) and 4 round arms(?) with balls on the end of the 4 arms. How can I find the value of it. Hello, I am trying to find 2 rings(stolen ages ago when I was young & foolish) 1) a beautiful old yellow gold pinky ring with old fashioned tiffany setting(wrapped around so it was less like prongs than pointed rounded triangles holding round fire opal in place.It was a very smooth flowing setting. The opal was round and you could turn it inside its setting by pushing the top. I am interested to determine the value of two items of jewelry by Merry Renk that I purchased from her in 1970. One is a silver buckle with a small pearl, and a gold wire ring with a small emerald. I think I have a bracelet by William Kerr. It has the picture of a woman with flowing hair and in between these two ladies (same lady) their are cherry blossums. When I flip it over it looks like pounded silver, not factory made. Can you tell me how I can tell if it is a William Kerr bracelet. It was given to me by a friend who said her Jewish grandmother left it to her. (All made out of silver). I saw a picture of this same lady in a museum book. Thanks. I know of several gold pieces (18K) by Coralynn Pence (1910-1994) and wonder how one can learn the value of these. my parents began collecting artist jewelry in the 1950’s. i have now inherited the collection. thanks to your online gallery i have been able to ascertain information about the artists and the value of the pieces. i have ed weiner, ed levin, ronald hayes pearson, and russell secrest. now that i know you have written books, i will learn more. 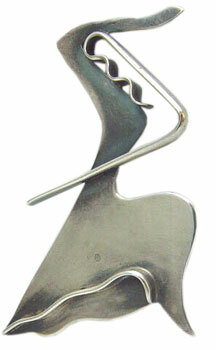 I am looking for Ed Wiener’s ‘Dancer’ brooch and one earring to match. All I have is one earring of the set, it was a gift to my wife for her birthday 20 years ago. She lost the brooch and one earring. “ ” Some of these devices are just a second screen for your smartphone.